Historic, scenic, underground, and unique is all I need to know about a location to add it on my “To Do” list. The fact it’s located just off the freeway and earns a 4.3 star Google Review is just the proverbial icing on the cake. The place I am referring to is the Mosier Twin Tunnels, on the Oregon side of the Columbia Gorge. 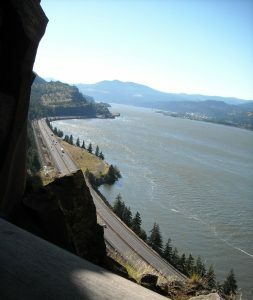 When the original Columbia River Highway was built through the Mosier, Oregon area in 1921, it was necessary to build two tunnels to get through a high rock point. The tunnels were modeled after those near Lake Lucerne in Switzerland with graceful arches and “windows” affording views over the river. However, the tunnels and nearby cliffs were always a source of trouble along the highway. Rocks often fell and blocked the road and even fell on cars in the early 1950’s. In 1954, a new highway (now Interstate 84) was opened closer to the river at water level and the tunnels were abandoned. The tunnels were back-filled with rock, left impassable and soon forgotten. 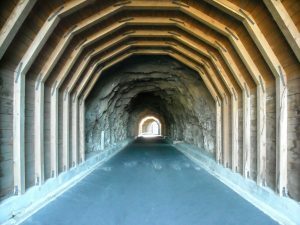 By 1995, work began to reopen the tunnels for tourist use as part of the Historic Columbia River Highway State Trail. This involved the removal of the backfill, rebuilding of the roadbed, repaving the road, and adding concrete sheds to protect users from rocks. Today you can enjoy the same curves, stonework railings, and sweeping vistas enjoyed by early motorists 100 years ago by hiking or biking the trail. Many hiking websites list a trip to the tunnels as a 9 mile round trip journey which would discourage some from visiting. However, that is the distance from the more popular west trailhead. If you start from the east trailhead, it is an easy 1.8 mile round trip which makes for a short hike or bike ride. Take the Mosier exit (Exit 69) off I-84. 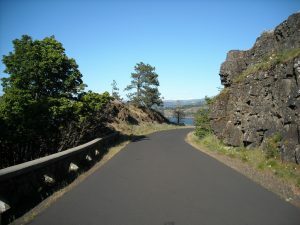 Turn south towards Mosier, after crossing over the bridge spanning the railroad tracks, continue about 100 yards taking the first left on Rock Creek Road which circles back under the bridge along the tracks. Drive about three quarters of a mile to the parking lot on the left. You will find the east trailhead at: N45° 40.922 W121° 24.464 Limited parking is available for those with a disabled parking placard at the trailhead. You will find the main parking area at: N45° 40.829 W121° 24.538 Space is limited, but I managed to park my truck and trailer (50 ft. combined length) there during our visit. A State Park day pass is required to park, which can be purchased online here. Overnight stays of up to 12 hours are allowed at the Melmoose Rest Area, a few miles east of Exit 69, and Hood River Rest Area (only accessible from westbound I-84) a few miles west of Exit 69. You can also find full hookup sites nearby at Memaloose State Park. Traveling the route of our housecar driving forefathers, just another adventure in RVing! This area of the Columbia River and farther west are amazing! This is a favorite of ours. We have driven this many times. It is very busy during the summer months because Oregonians are enjoying the sun.